A new Jacqueline Wilson, a new girl heroine in a shattering situation. This time it’s Ella, whose Mum lies in a coma as a result of eclampsia following the birth of Ella’s half-brother. Stricken with worry, and utterly bereft of her mum’s care, Ella has to cope with being looked after by her step-dad Jack whom she doesn’t even like. Even a longed-for visit from her own dad provides cold comfort when he fails to put his distraught daughter before his new partner. School is proving a trial too, as her best friend Sally has gone off with Dory, throwing Ella into the unwelcome company of the mean and horrible Martha. A school project on whales provides Ella’s path to redemption. 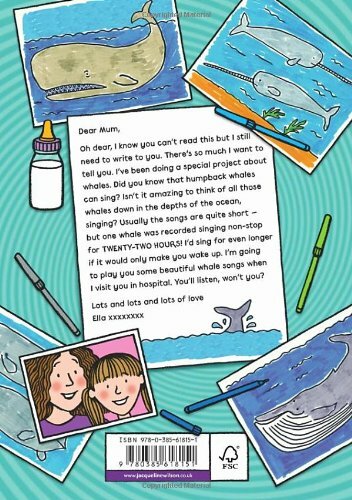 Humpbacks she discovers, can sing for hours, calling out their love to each other underwater, just as Ella sits at her mother’s bedside and hopes to reach her by repeating messages of love in her ear. And as the days go by with no improvement, some surprising things happen. Ella and Jack start to get on better, united in their determination to bring about the recovery of the woman they both love. Ella makes an unexpected new friend at school. And she begins to bond with the baby brother who has lost his mum before he even found her. Though the eventual happy conclusion to this story never feels seriously in doubt, it comes very quietly, right at the end. For this is less the life and death tale of a desperately ill mother, than of a girl finding out who and what can be relied on when the chips are down; of the qualities that really matter in people, and of the tremendous things that are possible when families pull together. All this Ella discovers, along with the idea that she might like to be a marine biologist when she grows up! I’m in awe once again of Jacqueline Wilson’s ability to take a desperate premise, and make of it an enthralling human story, that packs a much subtler emotional power than the headline drama suggests. Those who dismiss her for always doing the same thing miss the point. For readers at that tender age when forging a degree of emotional intelligence starts to become important, Wilson’s serial presentations of real lives in all their churning complexity, still cannot be beaten. Churning they might be, but churned-out, never.